This article was written by KH Lim and published in The EdgeProperty.com on 1 July 2016. Exciting times beckon I-Bhd, with the property developer currently laying the foundations of its next level of growth beyond the iconic i-City development. At a recent Bursa Malaysia event, I-Bhd deputy chairman Dato Eu Hong Chew said the company is in talks with various parties over land deals, which will build on the successes of i-City and 8Kia Peng. I-Bhd is once again readying itself to make another indelible mark on the property scene under the stewardship of its chairman, Tan Sri Lim Kim Hong. Who would have thought that the land on which the present-day i-City sits, which was purchased back in the 1990s and had a gross development value (GDV) of RM1.5 billion then, would be worth as much as RM9 billion (or more, as anticipated by the group) today. The age-old adage of fortune favouring the brave is epitomised by Tan Sri Lim’s foresight in purchasing the land in his personal capacity all those years ago and reaping manifold rewards. “The next step is the further enhancement of i-City’s GDV. We reckon the RM9 billion that we know of today is not the end of the story; there is probably another RM2 billion in the tank,” says Dato Eu, who also shared that the group is already looking forward to launching its next project. “I-Bhd is always on the lookout for land, be it in or out of the Klang Valley, as would most other developers that are hungry for continued successes. We are in no hurry, however, as we will only (and always) do transactions that bring greater value to all our shareholders. “With the current development in i-City still lasting another 10 years, our shareholders can rest assured that the long-term earnings sustainability of I-Bhd is at the forefront of our minds and will drive us to continue to enhance our intrinsic value. Though plans have not crystallised as yet, we are open to any future projects, being another urban development or even a complete township, if the conditions are right. “Ideally, we would like to follow the same asset-light strategy and integrated development model, which have been so successfully employed in the development of i-City — namely, doing it as a joint venture rather than just an outright land purchase, which will obviously be cash-draining,” Dato Eu adds. The ongoing construction of Central i-City, a one million sq ft mall, in collaboration with the Central Pattana Group of Thailand, as well as a four-star hotel by DoubleTree Hilton are just a few of the many exciting developments in this 72-acre freehold ultrapolis township. Various efforts are currently being undertaken to ensure that I-Bhd doubles its current property development revenue and hits a steady state of RM500 million to RM600 million per annum, also by 2018. The RM743 million in unbilled sales at the end of March 2016 are reflective of steps taken in the right direction. Many other value-enhancing initiatives are in the pipeline, which will likely tip the scales in the company’s favour and see its GDV exceed RM10 billion. Moving forward, i-City will not only be about property development but will also be abuzz with leisure-related activities and a property investment portfolio, providing it with rich streams of recurring income. The full story of i-City is only just unfolding. With a successful track record (in enhancing its GDV as well as creating value for its buyers), the company is going into the current property market, which is facing headwinds, on an extremely strong financial footing. It has zero bank borrowings, providing it with precious landbanking firepower, should the need arise. 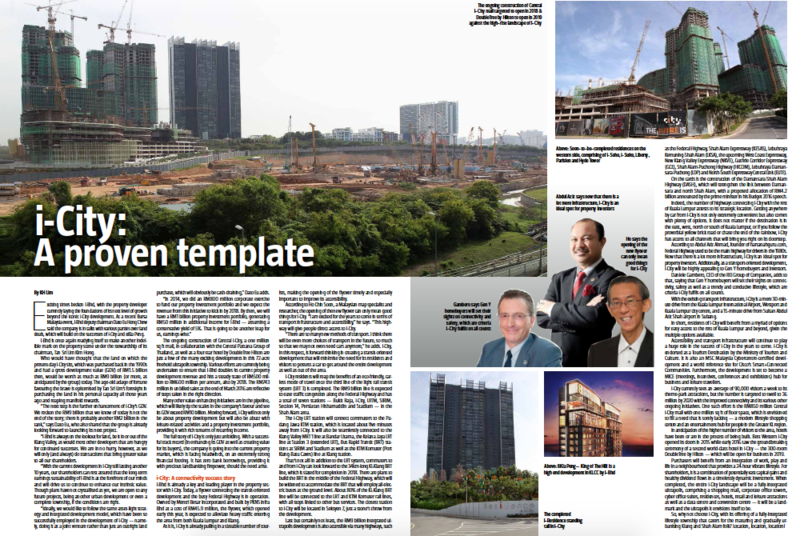 I-Bhd is already a key and leading player in the property sector with i-City. Today, a flyover connecting the transit-oriented development and the busy Federal Highway is in operation. Owned by Mentri Besar Incorporated and built by PKNS Infra Bhd at a cost of RM45.9 million, the flyover, which opened early this year, is expected to alleviate heavy traffic entering the area from both Kuala Lumpur and Klang. As it is, i-City is already pulling in a sizeable number of tourists, making the opening of the flyover timely and especially important to improve its accessibility. According to Ho Chin Soon, a Malaysian map specialist and researcher, the opening of the new flyover can only mean good things for i-City. “I am excited for the years to come in terms of transport infrastructure and accessibility,” he says. “There are so many new methods of transport. I think there will be even more choices of transport in the future, so much so that we may not even need cars anymore,” he adds. i-City, in this respect, is forward thinking in creating a transit-oriented development that will minimise the need for its residents and visitors to possess a car to get around the entire development as well as out of the area. i-City residents will reap the benefits of an eco-friendly, carless mode of travel once the third line of the light rail transit system (LRT 3) is completed. The RM9 billion line is expected to ease traffic congestion along the Federal Highway and has a total of seven stations — Bukit Raja, i-City, UiTM, SIRIM, Section 14, Persiaran Hishamuddin and Stadium — in the Shah Alam area. The i-City LRT station will connect commuters to the Padang Jawa KTM station, which is located about five minutes away from i-City. It will also be seamlessly connected to the Klang Valley MRT 1 line at Bandar Utama, the Kelana Jaya LRT line at Station 3 (extended LRT), Bus Rapid Transit (BRT) stations at SIRIM and Stadium as well as the KTM Komuter (Port Klang-Batu Caves) line at Klang station. That’s not all! In addition to the LRT system, commuters to and from i-City can look forward to the 34km-long KL-Klang BRT line, which is slated for completion in 2018. There are plans to build the BRT in the middle of the Federal Highway, which will be widened to accommodate the BRT that will employ all-electric buses at the ground level. About 80% of the KL-Klang BRT line will be connected to the LRT and KTM Komuter rail lines, with all stops linked to other bus services. 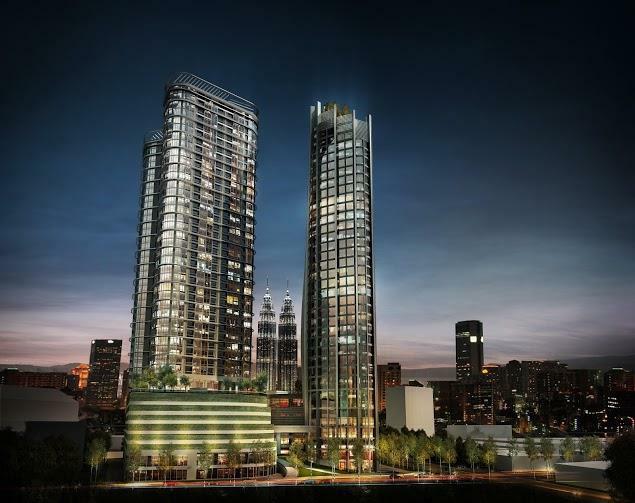 The closest station to i-City will be located in Seksyen 7, just a stone’s throw from the development. Last but certainly not least, the RM9 billion integrated ultrapolis development is also accessible via many highways, such as the Federal Highway, Shah Alam Expressway (KESAS), Lebuhraya Kemuning-Shah Alam (LKSA), the upcoming West Coast Expressway, New Klang Valley Expressway (NKVE), Guthrie Corridor Expressway (GCE), Shah Alam-Puchong Highway (HICOM), Lebuhraya Damansara-Puchong (LDP) and North-South Expressway Central Link (ELITE). On the cards is the construction of the Damansara-Shah Alam Highway (DASH), which will strengthen the link between Damansara and north Shah Alam, with a proposed allocation of RM4.2 billion announced by the prime minister in his Budget 2016 speech. Indeed, the number of highways connecting i-City with the rest of Kuala Lumpur attests to its strategic location. Getting anywhere by car from i-City is not only extremely convenient but also comes with plenty of options. It does not matter if the destination is in the east, west, north or south of Kuala Lumpur, or if you follow the proverbial yellow brick road or chase the end of the rainbow, i-City has access to all channels that will bring you right on its doorstep. According to Abdul Aziz Ahmad, founder of hartanahguru.com, Federal Highway used to be the main highway for drivers in the 1980s. 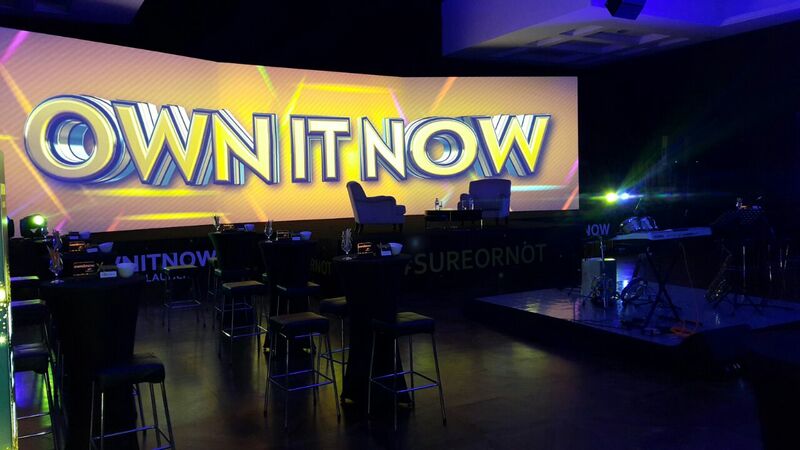 Now that there is a lot more infrastructure, i-City is an ideal spot for property investors. Additionally, as a transport-oriented development, i-City will be highly appealing to Gen Y homebuyers and investors. 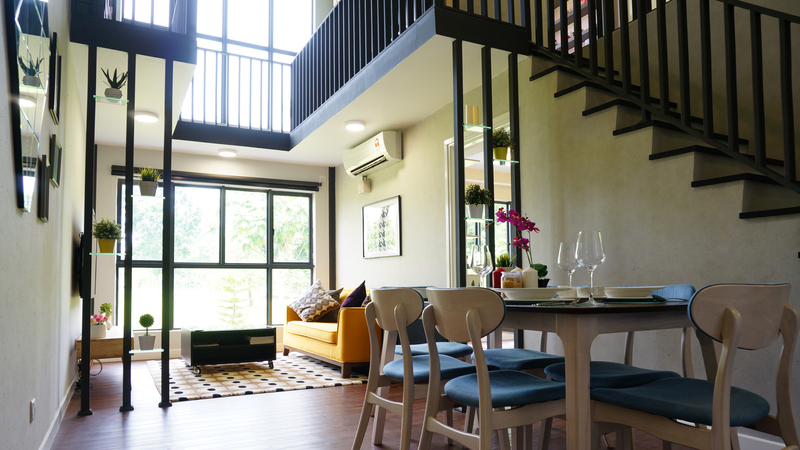 Daniele Gambero, CEO of the REI Group of Companies, adds to that, saying that Gen Y homebuyers will set their sights on connectivity, safety as well as a trendy and conducive lifestyle, which are criteria i-City fulfils on all counts. With the existing transport infrastructure, i-City is a mere 30-minute drive from the Kuala Lumpur International Airport, Westport and Kuala Lumpur city centre, and a 15-minute drive from Sultan Abdul Aziz Shah airport in Subang. In short, residents of i-City will benefit from a myriad of options for easy access to the rest of Kuala Lumpur and beyond, given the multiple options available. Accessibility and transport infrastructure will continue to play a huge role in the success of i-City in the years to come. i-City is endorsed as a Tourism Destination by the Ministry of Tourism and Culture. It is also an MSC Malaysia Cybercentre-certified development and a world reference site for Cisco’s Smart+Connected Communities. Furthermore, the development is set to become a MICE (meetings, incentives, conferences and exhibitions) hub for business and leisure travellers. i-City currently sees an average of 90,000 visitors a week to its theme-park attractions, but the number is targeted to swell to 36 million by 2020 with the improved connectivity and its various other ongoing initiatives. 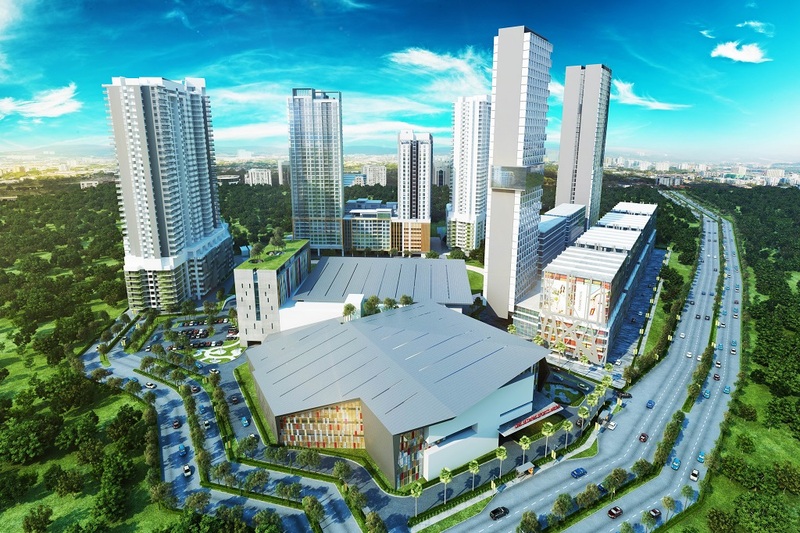 One such effort is the RM850 million Central i-City mall with one million sq ft of floor space, which is envisioned to fill a need that is sorely lacking — a modern lifestyle shopping centre and an entertainment hub for people in the Greater KL region. In anticipation of the higher number of visitors to the area, hotels have been or are in the process of being built. Best Western i-City opened its doors in 2015 while early 2016 saw the groundbreaking ceremony of a second world-class hotel in i-City — the 300-room DoubleTree by Hilton — which will be open for business in 2019. Purchasers will benefit from an integration of work, play and life in a neighbourhood that provides a 24-hour vibrant lifestyle. For shareholders, it is a combination of potentially vast capital gains and healthy dividend flows in a timelessly dynamic investment. When completed, the entire i-City landscape will be a fully-integrated ultrapolis, comprising a shopping mall, corporate office towers, cyber office suites, residences, hotels, retail and leisure attractions as well as a data centre and convention centre — it will be a landmark and the ultrapolis it envisions itself to be. So, why not choose i-City, with its offering of a fully-integrated lifestyle township that caters for the maturing and gradually urbanizing Klang and Shah Alam folk? Location, location, location!